Blame your smartphone. Not because the blue light it emits is keeping you awake… it’s because it makes you breathe less deeply! Scientists found that people who used their phones for more than 4 hours a day had lung function that was over 30% lower than those who used their phones less. And just so you know, the average teenager is on their phone 6 hours a day, so 4 hours isn’t a crazy amount! So why would phone use lead to poor lung function? Because we hunch our shoulders and bend our necks when using our phones. So our airway is restricted and we’re not fully expanding our lungs. As a result, we breathe more shallowly. Something went down the wrong pipe! Have you ever choked on something, or had a coughing fit and said, “Something went down the wrong pipe!” That’s actually a fairly accurate expression, according to pulmonary specialist, Dr. Richard Wunderink. He says we have two tubes that start at the back of our throat… One is the esophagus that leads to our stomach. The other is our trachea, which goes to our lungs. And if a sip of something accidentally goes down your trachea, you start sputtering and choking to get rid of it. To prevent that from happening, simply take smaller sips. If you love a good spin class – like Soul Cycle – get up out of the bike saddle to burn more calories. Because when your rump is off the seat, oxygen consumption jumps, which means you’ll get fitter faster. That’s according to the Journal of Strength and Conditioning Research. That’s because you’re having to support your body weight, so your lungs and heart are forced to work harder. If you’d like to seriously improve your health, sit as far from your computer printer as possible. A report in the journal Environmental Science and Technology found one-third of laser printers studied emit ultrafine particles of toner dust……And when inhaled, those particles end up deep in the lungs, and increase our risk for asthma, respiratory problems, and diseases, like emphysema. Do you suffer from heartburn? Read this! Want a simple medication-free way to reduce your potential for heartburn? Breathe more deeply. That’s according to Dr. Sophie Balzora, a gastroenterologist from NYU Medical Center. She says 30 minutes of deep breathing exercises every day can relieve acid reflux symptoms because it strengthens the muscles in your lower esophagus. So inhale through your nose, drawing air deep into your lungs, then exhale through your mouth. A good time to practice is when you’re commuting to and from work. If you’re sick, go ahead and cough. Because when you have a cold or flu, it helps clear your lungs. But suppressing a cough, on the other hand, stops the body from expelling mucus. If that happens, it can get trapped in the lungs and cause bronchitis. 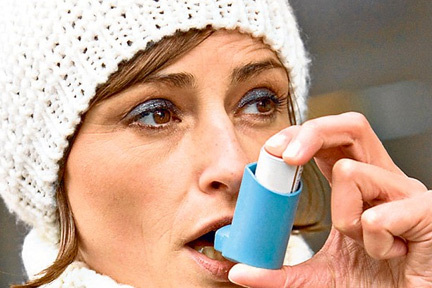 If you’re outside in freezing weather, protect yourself from an asthma attack. Cold air can trigger one by narrowing the passageways to your lungs. So, wear a scarf around your mouth and nose. That’ll heat up the air before it gets into your lungs, so it won’t shut down your airway. Reasons you should sit up straight. Hunching over takes 5 times more energy than sitting up straight, because it restricts your lung capacity and breathing! Also, uncross your legs and plant them flat on the floor. You’ll have better circulation and more energy.